Greetings rock n’ roll enthusiasts! It’s Andy Gesner and the staff from HIP Video Promo, back with a clip from a band that has already taken over Europe and has begun to sink it’s teeth into the United States. When we sent you the video for “Eddie’s Gun” a few months ago, we mentioned that in Britain, 2006 has been the year of The Kooks. The Brighton quartet landed six(!) tracks from their debut album on the U.K. top 40 charts and appeared on the BBC more frequently than Tony Blair. 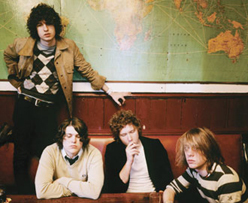 Since “Eddie’s Gun”, The Kooks have only further consolidated their hold over British mass consciousness:Inside In/Inside Out, the debut, has now gone triple platinum and sold over a million copies. All four members of the band have become national celebrities. In short, the stage is set for an American takeover: and we believe “Naïve” is the song that’s going to get them there. In England, it was their biggest hit yet, reaching #5 on the pop charts and prompting an unexpected (and live on national TV) cover by Lily Allen. Once you hear the song, it’s easy to see why it makes people want to sing it back: it’s got the kind of chorus that communicates both ache and attitude, and a melody that feels inevitable and impossible to forget. Frontman and guitarist Luke Pritchard can often be brash – though never less than endearing – but here he pulls back a bit to communicate fragility and uncertainty. The rest of the band follows suit, turning in a guitar-pop performance reminiscent of the best early work of Supergrass or The Strokes. The four Kooks are camera-friendly: regular young men with expressive faces and easygoing ale-house charisma. Pritchard, in particular, is a natural screen actor, and he’s been the featured character in the Kooks videos so far. Nick Gordon – a director who’s specialized in working with hip, photogenic British acts (Placebo, Turin Brakes, Starsailor) – coaxes a wounded-tough performance out of Pritchard in the engrossing “Naïve” clip. 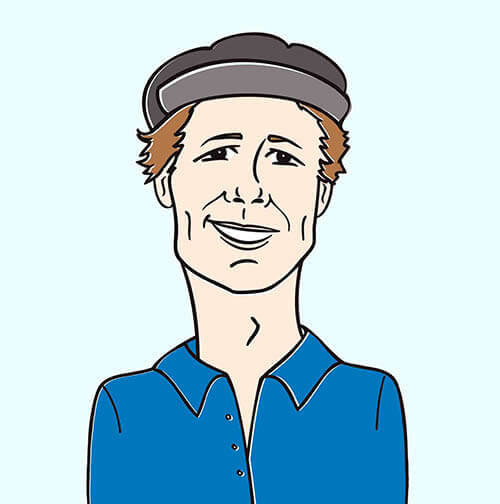 This is Gordon’s first rock video since Autumn ’01, but make no mistake about it – he still understands the indie vibe and the anxiety of being young and lost in a beautiful crowd. The “Naïve” video is, at face value, a love story; a tale of a relationship in trouble. But there are other thematic undercurrents just beneath its surface: the perils of the rock and roll lifestyle, the lure of intoxication, the strange interchangeability of identity under the stage lights. Pritchard plays a young man searching for his girlfriend in a crowded club. While the band rocks onstage, he bounces through a crowded room, pulling aside all the blondes he sees: some react with bleary-eyed disdain, others with inviting smiles. Meanwhile, his girl is at the bar, drinking herself into a stupor. Though his mates are around to crack jokes with him, the scene becomes something of a horror show: pent-up aggression, mistaken glances, the dynamics of misapprehension writ large. Finally he sees his girl stumbling out of the bathroom; she’s drugged but defiant. Unable to summon the words or gestures to connect with her, he turns away and rejoins the night. Time and time again, Krista Crews and the Astralwerks team have brought us the best clips on the music video landscape, and this is no exception! It is our greatest pleasure to continually work together. If you didn’t get your hands on Inside In / Inside Out the first around, let us know, and we’ll set you up with anything you need for your on-air giveaway needs. If you need more info, call Andy Gesner at 732-613-1779 or email us at HIPVideo@aol.com.